I’ve managed to re-create nearly everything that I missed from gluten days. Gooey Cinnamon Buns. Check. Amazing pizza. Check. Oatmeal Chocolate Chip Cookies. Check. Plus, another 400+ recipes that I didn’t really NEED, but it’s nice to have, just in case. 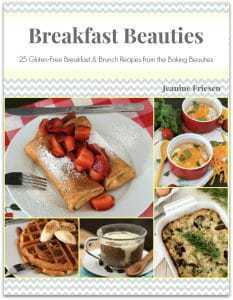 😉 I seldom buy gluten-free products, I usually try to make my own instead. But, I will buy cereal, pasta, and ice cream cones. One thing that I miss, that I don’t think I’ve even seen a store-bought version available, is ice cream sandwiches. It’s been over 4 years since I’ve enjoyed an ice cream sandwich, so I figured maybe it was time to do something about that. And so I created this recipe for a crisp dark chocolate wafer, that can be used for sandwich cookies (read “Oreo” knock-offs”), or pulsed in the food processor for chocolate crumbs, great for cheesecakes and gluten-free rum balls. 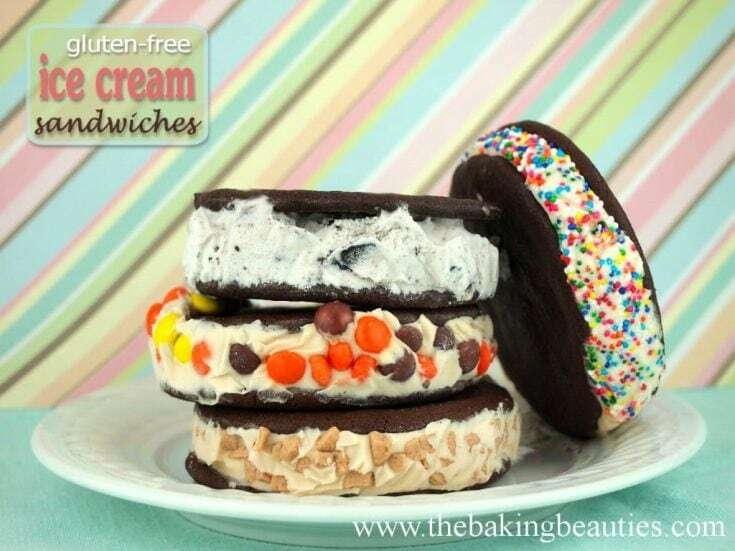 Or, you can use them to make gluten-free ice cream sandwiches! 🙂 To make ice cream sandwiches, scoop softened ice cream onto a cool cookie, and top with another cookie. Wrap each ice cream sandwich in plastic wrap and store in the freezer. It is best to do this in advance so that the cookie has a chance to soften and the ice cream has a chance to harden before they are eaten. These gluten free Crisp Chocolate Wafers are perfect for "Oreo" knock-offs, ice cream sandwiches, or process into crumbs for the perfect cheesecake base. Preheat the oven to 375°F. Tear two pieces of parchment paper the size of your baking pans. In the bowl of a stand mixer fitted with a paddle attachment, beat together the butter and granulated sugar until well combined. Add the rum (or rum extract) and egg. Beat until well mixed. In a medium mixing bowl, whisk together the brown rice flour, tapioca starch, cornstarch, xanthan gum, cocoa powder, baking powder, baking soda and salt. With the mixer running on medium-low, add the dry ingredients to the sugar mixture. Mix until well combined. Working with a handful of dough at a time, roll out the dough directly on one of the pieces of parchment paper that you prepared. You can sprinkle the parchment paper with a light dusting of sweet rice flour, if you wish. It will make removing the excess dough a little easier. Place plastic wrap on top of the dough to keep it from sticking to the rolling pin. Reposition the plastic wrap as necessary, and keep rolling the dough out until it is about 1/8” thick. Use a cutter, about 2 1/2-inches wide, to cut the cookies out of the rolled dough. Do not remove the cookies though. Rather, using a rubber spatula or knife, carefully remove the excess dough around the cookies, leaving the cookies on the parchment paper. Leave about 1-inch between cookies when cutting them out. The excess dough that is removed can be rolled out again for the next pan of cookies. Place the parchment paper with the cookies onto a baking sheet, and bake in preheated oven for 8 minutes. While the cookies are baking, you can roll out and prepare the next batch on the other piece of parchment paper. Remove cookies from oven, and allow the cookies to remain on baking pan for a few minutes before removing to wire cooling rack to cool completely. Repeat this process until you have baked all the cookies, re-rolling the dough that you remove from between the cookies. Once cookies are completely cool, you can store them in an air-tight container. These cookies also freeze wonderfully. Jeanine, these are beautiful! I have to try them. 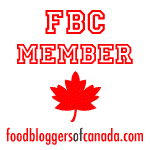 I was SO excited to see this on my blogger dashboard! I’ve been trying to find a gluten free ice cream sandwich recipe for ages THANK YOU :). Love love love the pictures. These look delicious! Only thing is, I’m corn-free as well. Are there any substitutes for corn starch in your recipes? I haven’t tried it, so I don’t know the results, but you could try substituting the cornstarch with either arrowroot starch or potato starch. If you try either, let me know how it works! Do you think that the cookie part would work, if you baked it in large sheets and then crushed it up as a crust for cheesecake? Thank you so much for this recipe! It is actually gluten free Oreos! What an AWESOME cookie to have and love and eat and love and….oh wait…I mean bake for my customers too! Yum yummy yum! Thank you thank you! You’re very welcome, Kristen! I agree, homemade oreos are another great use for them, you can alter the filling flavours then too. Mmm…possibilities are endless! These cookies are amazing!! My husband even loves them even though he doesn’t like chocolate. And my mom ate about half the batch when she tried them! We love making them into ice cream sandwiches. They present a very unique and easy dessert item when entertaining guests! I will give one suggestion or two for the first time baker of these delicious wafers, when I bake these, they only need to bake for 5 minutes or even less than that. Also, let the cookie sheet cool off between bakings. Makes them cook more evenly and less likely to burn. Otherwise, amazing recipe!! Thank you so much for making this available! Gluteb free can taste amazing!! Great tips, Hannah! Thanks for sharing! i’m super interested in using as crumbs in a dessert square that I make, but wondering if you can make in advance and how you store it? Would you process the cookies when cool and put crumbs in freezer to have on hand when ready to use?